Employees living behind Old Faithful Lodge were shut out of their dorm for eight hours today after a propane gas leak Wednesday. 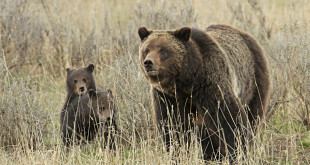 The Confederated Salish and Kootenai Tribes (CSKT) have come out against the proposal to remove Yellowstone grizzlies from the Endangered Species List. Earlier this week, a pair of Yellowstone tourists were caught with a red dog in their SUV—but not for the reason you would assume. Federal officials will be hosting a meeting in Bozeman April 12 to answer questions about the Yellowstone grizzly bear population.